AMMAN — Jordanians on Wednesday took to Zarqa’s streets in a show of support for His Majesty King Abdullah’s stances towards Jerusalem. 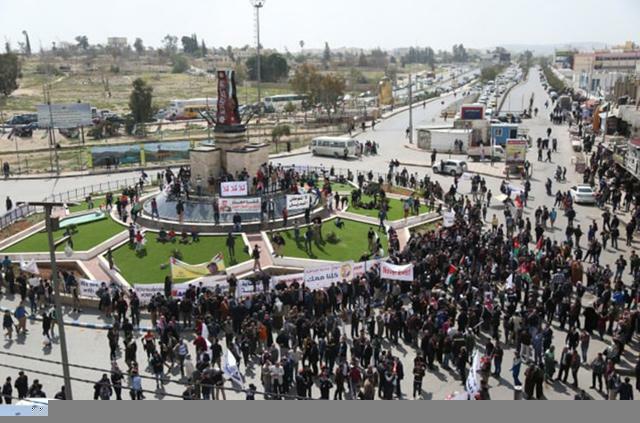 Jordanians marched to Arab Army Square in Zarqa Governorate, 22km northwest of Amman, where they held a rally waving Jordanian flags, the Jordan News Agency, Petra, reported. “Jerusalem is a Red Line,” one of the banners carried during the march read. Others read “No Alternative Homeland”, “Yes for the Hashemite Custodianship over Jerusalem’s Islamic and Christian Holy Sites” and “No Settlement”, according to Petra. Organised by the Zarqa Governorate Council, the rally was designed to show that public stances align with King Abdullah’s positions expressed at international forums, as well as to renew rejections of any solution to the Palestinian cause which comes at the expense of the Kingdom, the president of the council, Ahmad Eleimat said. In solidarity with Jerusalem, King Abdullah previously called off a planned trip to Romania following a pledge by Romanian Prime Minister Viorica Dancila to move her country’s embassy in Israel to occupied Jerusalem. The Romanian prime minister recently pledged during a trip to Washington that her country would move its embassy in Israel from Tel Aviv to occupied Jerusalem, breaking with both the EU position and with her own country’s president, according to AFP. Prime Minister Viorica Dancila made the announcement at the annual conference of the American Israel Public Affairs Committee (AIPAC), an influential pro-Israel lobby. Her stance would align Romania with the US position under President Donald Trump, and it came on a day when Israeli Prime Minister Benjamin Netanyahu was beginning a Washington visit which included an AIPAC appearance and a meeting with Trump.